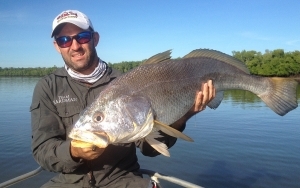 While the mighty barramundi is the most well known of Northern Territory sportfish, there are a plethora of hard-fighting fish species available that are of interest to anglers. All of the species listed below are found in waters near the Arnhem Land Barramundi Nature Lodge at different times of the year. Reef fish are found primarily on offshore reefs with some species, such as the famous black jewfish and golden snapper, also encountered around estuary rock-bars in a similar environment to barramundi. They can be caught on trolled or jigged lures, or by dropping down a fresh bait. Freshwater fish such as saratoga are found in the headwaters and billabongs of our river and creek systems. The saratoga, like the barramundi, is a predator with keen eyesight that will often respond to surface lures and flies.